Vegetarian Cookster: Eating out at the "Mo's"
I fibbed a bit; yesterday's post won't be my last for the week because I almost forgot that I wanted to mention my recent restaurant meals. Thursday night I saw a Dave Matthews Band show, and my BF and I stopped at Montana's for dinner before the show. We had eaten there once before; I had a pasta dish which was pretty good but sun-dried tomatoes were part of the dish's name, and I remember there being very little of them on my plate. I wasn't too impressed. 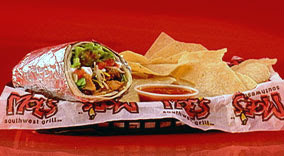 On Saturday, my BF and I ate at one of our favorite 'fast' food places: Moe's Southwest Grill. I like Moe's because they have various vegetarian options on the menu, and you can customize your burritos. For instance, Sunday I asked them to hold the cheese and sour cream (the woman looked at me like I was nuts for not wanting these items on my burrito!) but they added black olives, onions and cilantro to my "Art Vandalay." Plus, their burritos are huge so you definitely get your money's worth! Moe's sounds like a great place. We haven't explored detroit, but can't wait to do so!